14 HONDIUS, H. / JANSSON, J. Americae pars meridionalis. Amsterdam, 1639-1649. Col. d'�poque. Fente en bas du pli central sur 8 cm avec manque sur 8 mm de large. - In original colours. Paper slightly age-toned as usual with some offsetting due to oxidation of ink. Split lower part center fold (8 cm) with some loss of image (8 x 80mm). 460 x 550 mm. � Carte d'Am�rique du Sud orn�e d'un cartouche flanqu� de six Indiens. 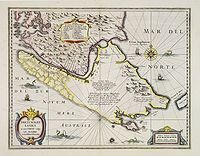 - Decorated with several ships and sea monsters, and a cartouche flanked by engravings of six Indians, netted hammocks and South American fauna. 15 HONDIUS, H. / JANSSON. 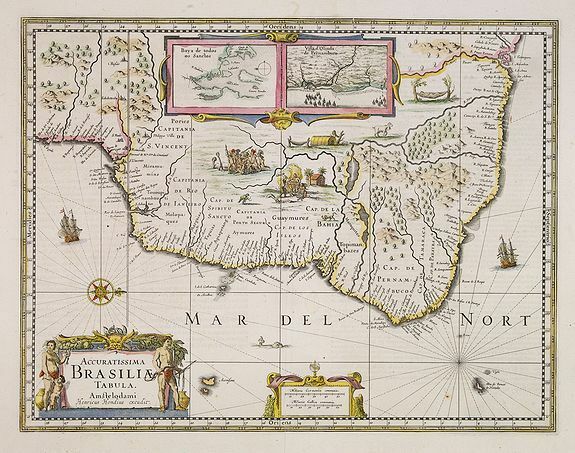 Accuratissima Brasiliae tabula. Amsterdam, 1639-1649. Beau col. d'�poque. Bel exemplaire. - Wide margins. Generally in good condition. In original colours. 380 x 487 mm. � Carte du Br�sil orn�e de 2 cartouches � l'int�rieur de la carte figurant : "Baya de todos os Sanctos" et "Villa d'Olinda de Pernambuco" et de sc�nes anthropophagiques. Texte en fran�ais au verso. 16 HONDIUS,H. / JANSSON, J. Freti Magellanici ac novi Freti vulgo Le Maire. Amsterdam, 1639-1649. Beau col. d'�poque. Fente en bas du pli central sur 8 cm et 2 petites d�chirures en bas de carte restaur�es. - Repair of split lower part centerfold 8 cm into engraved area and of 2 small tears in the lower part of the map. In original colours. 386 x 488 mm. 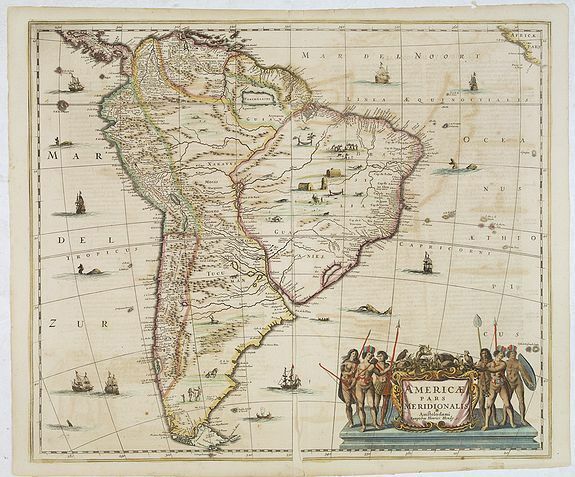 � Carte repr�sentant la Terre de Feu et le D�troit de Magellan. Texte en fran�ais au verso. - Map of Tierra del Fuego. Hondius added a Dutch translation of the explanatory text of the passage by Barent Jansz. Potgieter who accompanied captain Sebald de Weert to the Straits in 1599/1600, being the first Dutch vessels to sail through the Strait of Magellan. 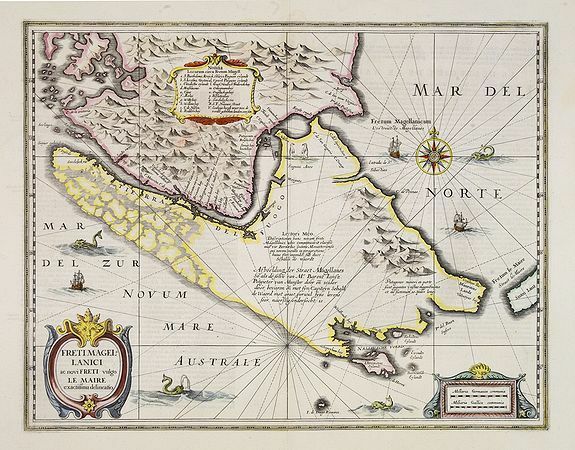 After various English voyages, the Dutch appeared in the Strait of Magellan in 1599. 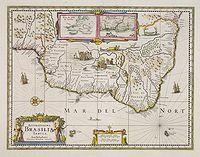 One of the Dutch pioneering voyages to the Southwest was the one by Jacques Mahu and Simon de Cordes, who were sent out by Rotterdam merchants. 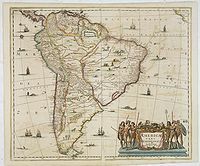 The five ships of this fleet were the first Dutch vessels to sail through the Strait of Magellan. One of them, the De Liefde , completed the crossing of the Pacific, reached Japan and laid the foundations for Dutch trade there. - Koeman/Krogt, Atlantes Neerlandici, Vol.I, 9950:1B.